Since 2012, the Kentucky Folklife Program has proudly called Western Kentucky University’s Department of Folk Studies & Anthropology home. This year, the WKU Folk Studies Program is celebrating a century of folklore research and teaching at WKU. To celebrate, Folk Studies faculty, Michael Ann Williams and Ann Ferrell, have partnered with KFP’s Virginia Siegel to create a poster commemorating the last 100 years. 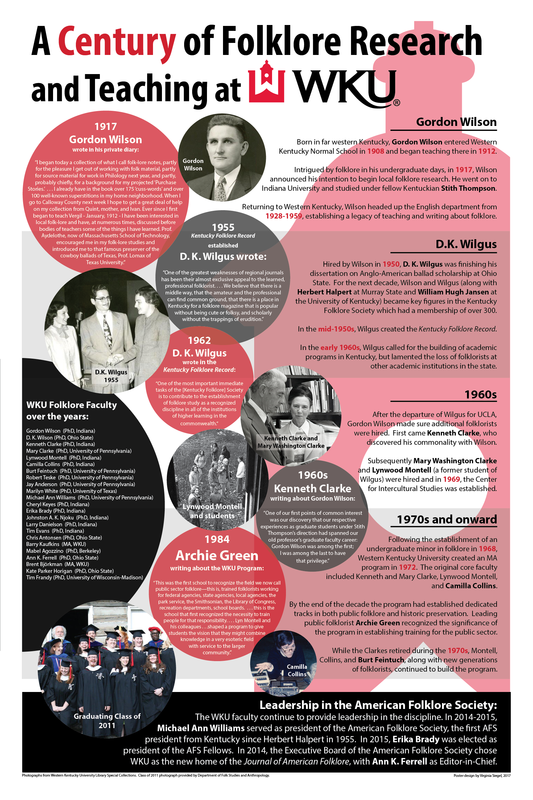 View the poster and read on to learn more about the history of folklore at WKU. Born in far western Kentucky, Gordon Wilson entered Western Kentucky Normal School in 1908 and began teaching there in 1912. Intrigued by folklore in his undergraduate days, in 1917, Wilson announced his intention to begin local folklore research. He went on to Indiana University and studied under fellow Kentuckian Stith Thompson. Returning to Western Kentucky, Wilson headed up the English department from 1928-1959, establishing a legacy of teaching and writing about folklore. Hired by Wilson in 1950, D. K. Wilgus was finishing his dissertation on Anglo-American ballad scholarship at Ohio State. For the next decade, Wilson and Wilgus (along with Herbert Halpert at Murray State and William Hugh Jansen at the University of Kentucky) became key figures in the Kentucky Folklore Society which had a membership of over 300. In the mid-1950s, Wilgus created the Kentucky Folklore Record. In the early 1960s, Wilgus called for the building of academic programs in Kentucky, but lamented the loss of folklorists at other academic institutions in the state. After the departure of Wilgus for UCLA, Gordon Wilson made sure additional folklorists were hired. First came Kenneth Clarke, who discovered his commonality with Wilson. Subsequently Mary Washington Clarke and Lynwood Montell (a former student of Wilgus) were hired and in 1969, the Center for Intercultural Studies was established. Following the establishment of an undergraduate minor in folklore in 1968, Western Kentucky University created an MA program in 1972. The original core faculty included Kenneth and Mary Clarke, Lynwood Montell, and Camilla Collins. By the end of the decade the program had established dedicated tracks in both public folklore and historic preservation. Leading public folklorist Archie Green recognized the significance of the program in establishing training for the public sector. While the Clarkes retired during the 1970s, Montell, Collins, and Burt Feintuch, along with new generations of folklorists, continued to build the program. 1984, Archie Green writing about the WKU Program: “This was the first school to recognize the field we now call public sector folklore—this is, trained folklorists working for federal agencies, state agencies, local agencies, the park service, the Smithsonian, the Library of Congress, recreation departments, school boards. . . . this is the school that first recognized the necessity to train people for that responsibility. . . . Lyn Montell and his colleagues . . .shaped a program to give students the vision that they might combine knowledge in a very esoteric field with service to the larger community. The WKU faculty continue to provide leadership in the discipline. In 2014-2015, Michael Ann Williams served as president of the American Folklore Society, the first AFS president from Kentucky since Herbert Halpert in 1955. That same year, in 2014, the Executive Board of the American Folklore Society chose WKU as the new home of the Journal of American Folklore, with Ann K. Ferrell as Editor-in-Chief. In 2015, Erika Brady was elected as president of the AFS Fellows. All photographs from Western Kentucky University Library Special Collections. Class of 2011 photograph provided by the WKU Department of Folk Studies and Anthropology.